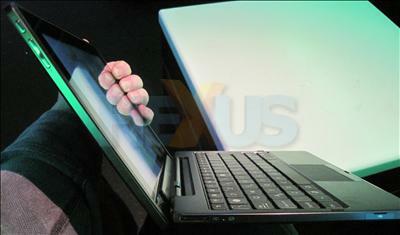 Unveiled at CES this year, the Asus Eee Pad Transformer is ready to hit UK markets. 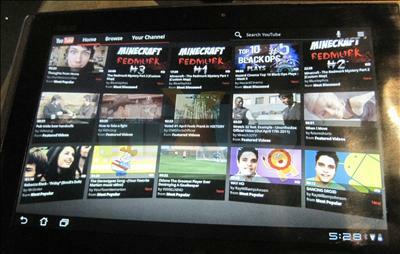 We caught up with John Swatton of Asus yesterday and had a hands-on with the hybrid tablet. Alongside Acer Iconia Tab W500, Asus Eee Pad Transformer will be the only hybrid tablet to be available next month. Priced lesser than the W500, it is the only Honeycomb tablet that features a hybrid docking system, powered by NVIDIA Tegra 2 dual core processor. Differentiating factors of the Asus Transformer include one year's free cloud storage, an extra battery in the dock and a tougher Corning Gorilla Glass, much like the one in the Acer tablet. The Transformer has front (1.2 megapixel) and rear (5 megapixel) cameras too. While the current version expects to deliver 720p media, Asus is known to be working on a 1080p version too. The pad alone comes with a mini HDMI 1.3 port with a microSD card reader, along with a microphone, headset jack and a provision to dock in the keyboard. The keyboard has a couple of extra USB 2.0 ports, another HDMI, headphone jack and a memory card reader. When the venue's Wi-Fi connection allowed it we were able to spend some quality time with the Transformer. It's a solid piece of kit with a good-looking, responsive screen. Honeycomb has some decent features, which we hope to explore in greater depth when we get a review unit, but the tablet OS also has a ‘version 1.0' feel to it, and lacks polish. The central piece of Asus' marketing pitch, of course, was the hybrid docking design. When we asked about the dual personality of the hybrid tablet, Swatton said the company asked consumers what kind of enhancements they were looking for. While 56% of them were looking for software enhancements, about 36% were looking for an option to have a keyboard. But it remains to be seen how many people are prepared to lug around an additional keyboard (620 g) which almost weighs as much as the tablet (680 g) itself. Swatton told us that the Transformer pad alone will run up to ten hours, but the battery life might jump to as much to 16 hours, when the keyboard is attached. Pricing isn't bad actually; it's a little less than the equivalent iPad 2. While the 16GB pad alone is available for £379, the pad and the keyboard dock will cost £429. Asus said the keyboard dock might be purchased separately, but pricing details aren't available yet. The 32GB version would also be available for £429. 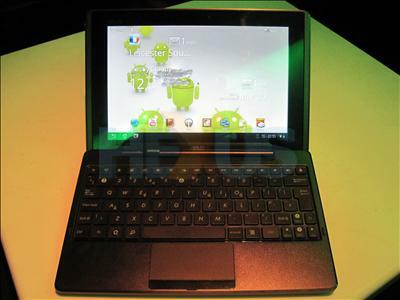 While the Wi-Fi versions will be available on April 6, Asus said the 3G versions will be available in two month's time. Ready for pre-order now, it will be available at PC World, Currys, Comet and Carphone Warehouse very soon.